Born at Winnipeg on 6 May 1897, daughter of John Stewart Hall (1866-1952) and Susana Elizabeth “Susan” Pearson (1868-1958), her father, a partner in the firm of Hall Brothers with his brother William Hall, named his steamboat Gertie H after her. Graduating from the Winnipeg General Hospital Nursing School (1921) and the Grace Hospital Nursing School, she received a scholarship and took post-graduate studies on teaching and supervision at McGill University. After working 12 years as a Manitoba public health nurse, she became active in the Manitoba Association of Registered Nurses (MARN), serving as a nursing school adviser and the organization’s Executive Secretary (1936-1943). She then became Director of Public Health Nurses with the Winnipeg Health Department (1943-1944), earning the praise of Dr. M. S. Lougheed as “having done wonders in raising the morale of the pubic health nurses under her supervision.” She then moved to Montreal as the Executive Secretary (1944-1952) and National Advisor of the Canadian National Association of Registered Nurses prior to concluding her career as Director of Nursing at the Calgary General Hospital (1952-1960). In the face of pending budget cuts, she resigning her position on 23 June 1960. An advocate for a Chair of Nursing at the University of Manitoba, she was also a lead organizer in developing emergency or epidemic measures in Manitoba. A member of the Business and Professional Women’s Club, in 1959 she was named an Honorary Life Member of the Winnipeg General Hospital Alumni Association. She died at the Calgary General Hospital on 14 October 1960 and her body was returned to Winnipeg for burial in Elmwood Cemetery. “Nurses receive diplomas,” Winnipeg Tribune, 12 May 1921, page 2. “Society [Miss A. E. Russell entertained ...],” Winnipeg Free Press, 26 October 1936, page 6. “Reports indicate that prospects are brightening for nursing profession,” Winnipeg Tribune, 6 February 1937, page 17. “Home Economics Association hears Miss Gertrude Hall on refresher course for nurses,” Winnipeg Tribune, 15 January 1942, page 9. “Gertrude Hall, new Director of Public Health Nurses,” Winnipeg Free Press, 13 July 1943, page 8. “Miss Gertrude Hall named Head of Public Health Nurses,” Winnipeg Tribune, 14 July 1943, page 8. “Miss M. Street takes new duties,” Winnipeg Free Press, 14 July 1943, page 9. “Miss Hall’s resignation accepted “with regret”,” Winnipeg Tribune, 6 July 1944, page 7. 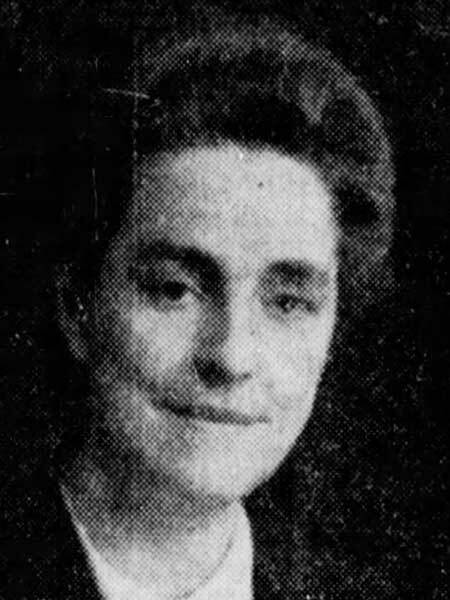 [Photo caption, Miss Gertrude Hall],” Winnipeg Free Press, 15 October 1944, page 7. “B. and P. Club honors Miss Gertrude Hall,” Winnipeg Tribune, 10 October 1944, page 8. “Nurses from Winnipeg go to Stockholm,” Winnipeg Tribune, 10 June 1949, page 11. Photo caption [Miss Gertrude M. Hall], Winnipeg Free Press, 24 April 1951, page 10. Obituary, Winnipeg Free Press, 21 July 1952, page 25. “Nursing Director quits Calgary Hospital,” Winnipeg Free Press, 25 June 1960, page 6. “Former nursing executive here dies in Calgary,” Winnipeg Free Press, 17 October 1960, page 4. Death notice, Winnipeg Free Press, 17 October 1960, page 27.